The end to our Christmas feast was rum raisin pie. This pie had piqued my interest back when I first got my copy of Martha Stewart's Baking Handbook , and I was glad to finally give it a try. 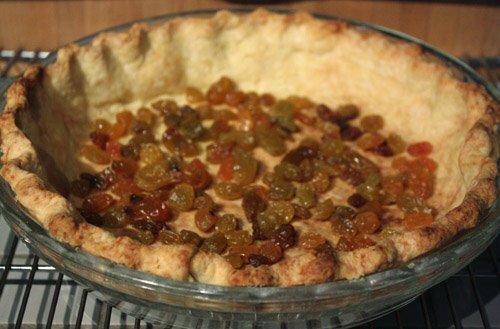 A blind baked crust receives a scattering of golden raisins before the rum-laced custard is poured into it. It’s baked until set, allowed to cool, and then chilled before serving. 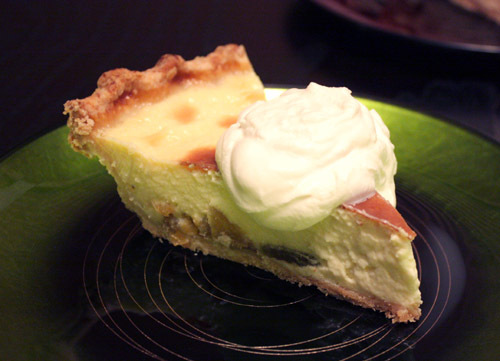 The custard was smooth and nicely flavored by dark rum. The plump raisins were chewy and delicious, and I would add more of them next time. Lightly sweetened whipped cream further gilded an already lovely dessert, and no one complained about it. In fact, there were no complaints about this dessert at all. On a day full of feasting, when dessert is still enjoyed, it must be a good one. For Christmas dinner, I decided to rely on the Whole Foods smoked meat service. Since trying pheasant for the first time in October, I had been pondering the possibility of smoked pheasant, and that became the focus of our meal. 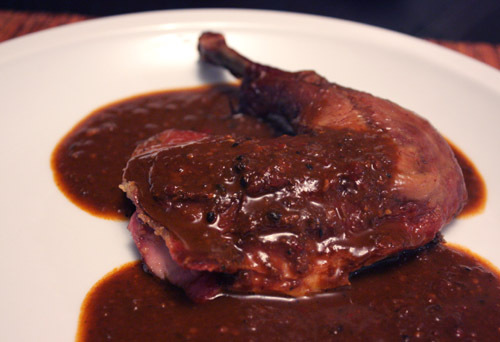 The pre-smoked, and therefore fully cooked, birds allowed me to spend some extra time on the sauce: mole rojo from Rick Bayless’ Mexico One Plate at a Time . I had made mole once before, but this was my first time following this recipe. This was actually a kind of quick and easy mole believe it or not. The preparation began with roasting tomatillos and frying and soaking dried chiles. Garlic, almonds, and raisins were also fried. The chiles were pureed first and then cooked down some before water was added. The other ingredients were pureed with the addition of bread, cinnamon, black pepper, cloves, and chocolate. That combination was added to the simmering chiles, more water was added, and all continued to simmer. I found that the consistency was a bit thinner than I’m used to seeing, so I left it all to reduce a few extra minutes. 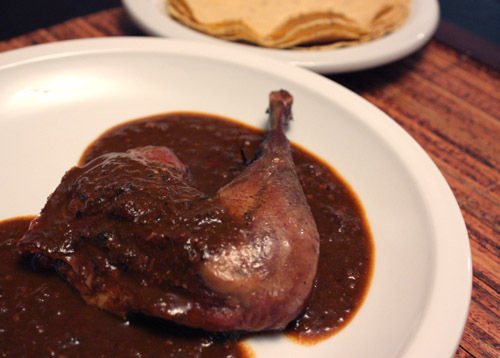 The smoky, rich flavor of the pheasant slathered in mole sauce was just what I’d hoped to concoct. If you haven’t ordered smoked meats from Whole Foods, I highly recommend you try it. Any meat, any time, they’ll smoke it. At least they do at our local store. And, pheasant? It’s like the best, most flavorful chicken you’ve tasted but better. The mole was complex, earthy, spicy, and aromatic. I intentionally added extra dried chiles with some heat, but the finished sauce was well-balanced. 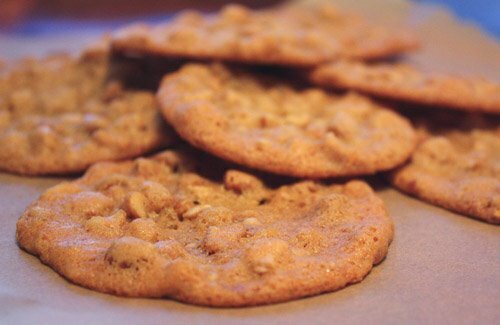 The raisins added a little sweetness, the garlic punched up the flavor, the almonds smoothed things out, and the spices tricked the palate in several good ways. The pheasant and mole were served with warm corn tortillas, green beans with fresh nopales, and purple potatoes roasted with ancho powder. We toasted with a bold tempranillo, and tucked into yet another satisfying and very filling holiday meal. The remaining meat and sauce became pheasant-mole enchiladas. I’m definitely not ready for New Year’s resolutions or light and healthy meals just yet. 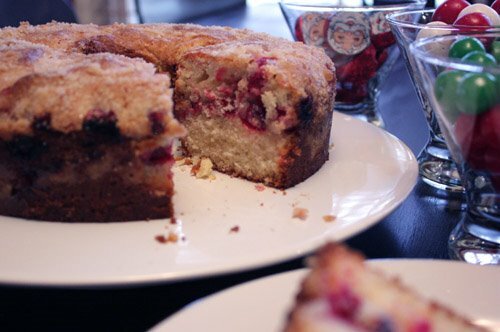 A warm oven, vanilla scented sugar, and bright juicy cranberries joined the start of our Christmas morning. 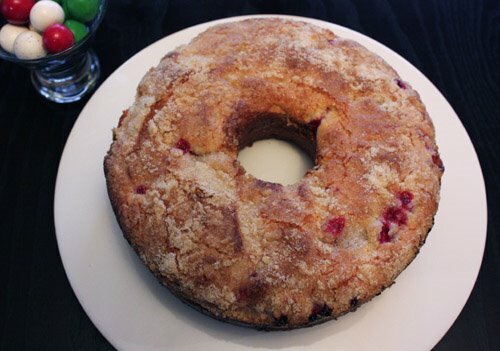 This cranberry vanilla coffeecake appeared in the December issue of Gourmet. While the flavors were perfect, I couldn’t resist making a couple of changes to the preparation. I really like cranberries, so I chose to leave them whole instead of chopping them in a food processor. Since I passed on the use of a food processor for that step, I didn’t pulse the vanilla with the sugar either. I just stirred the seeds into the sugar and broke apart clumps with my fingertips. I tossed some vanilla sugar with the whole cranberries, and I used a bit less sugar than recommended. The next change to the recipe was accidental. Maybe I still had sugar plum fairies dancing in my head because I misread the ingredient list and used a whole vanilla bean rather than half. No worries, though, the extra seeds did no damage. One last adjustment was the use of a tube pan in place of a round cake pan. The coffeecake was more festive baked in the tube pan shape. Batter was layered in the bottom, followed by the cranberries, then more batter was added before the vanilla sugar crumb topping. The vanilla, of course, smelled fantastic as the cake baked. The cranberries were tart and juicy and made a pretty filling. 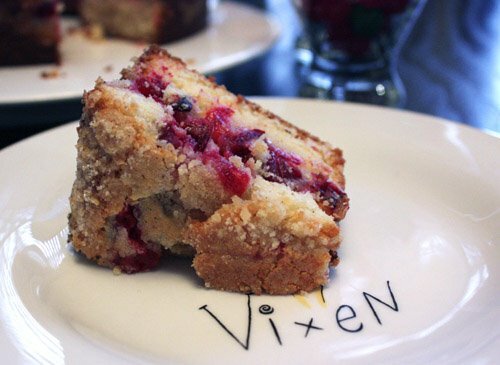 The crunchy, crumbly top with the tender center made this coffeecake a winner. I have a feeling the leftovers won’t last long enough. I approach a Christmas Eve menu with the intention of keeping it simpler than Christmas day and keeping it mostly meatless. It also tends to be Italian, and this year I decided on a main course of risotto. When I make risotto at home, it’s always with either mushrooms or seafood, but this time I wanted to try something different. 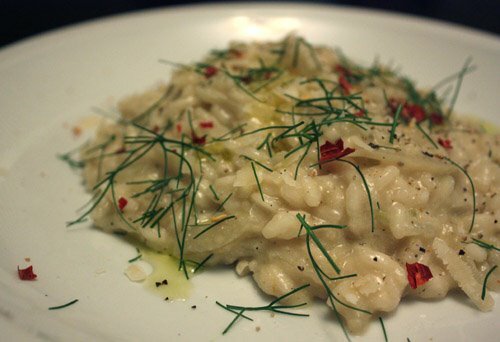 So, I asked Kurt to pick a risotto from Jamie's Italy , and he chose this fennel and dried chili variation. The preparation begins the same as any other risotto except that Jamie includes chopped celery with the onion and garlic. Once those are sautéed together, the rice is added and stirred until translucent. Then begins the dance of adding wine and stirring and then chicken broth and stirring and then stirring more and more and so forth. I don’t mind the stirring so much when I have a nice glass of Sangiovese and some sharp provolone and asiago for refreshment, and I did have those things nearby and all was well. For this dish, there were two pans of sautéing vegetables working at once. Thinly sliced fennel and some mashed-up fennel seeds cooked while the risotto got its start. The fragrance of the fennel and fennel seed cooking together was enough to tell me this was going to be a fine meal. 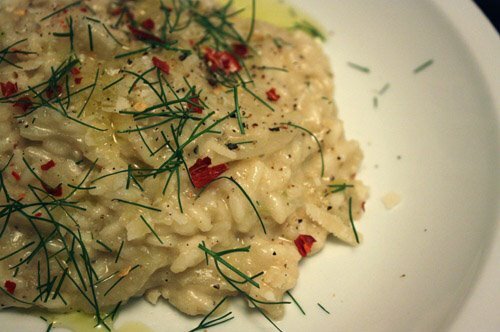 When the risotto reached the half-way point, the sautéed fennel was added. At the end of the cooking time, butter and parmigiana were stirred in with lemon zest, lemon juice, and some ricotta. To serve, each plate was topped with torn, dried red chilis, fennel tops, a drizzle of olive oil, and a bit more parmigiana. The sweet fennel flavor with the hot red chilis worked nicely, and the lemon did a lovely job of perking up everything else. 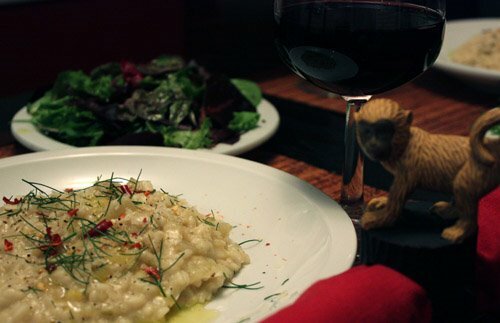 Kurt did well with his risotto selection, and we’ll definitely be making this one again. With a flip of a whisk and a spin of a spoon, my Christmas cookies are baked, wrapped, and ready to share. Here are three more that I tried for the first time this year. First are these jewel-toned trios from Gourmet magazine. 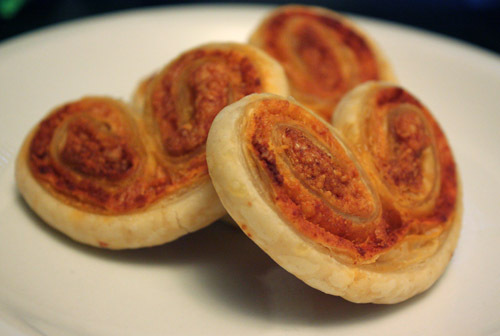 They appeared in Gourmet’s December 2007 issue and again in their list of best cookies from 1941 – 2008. 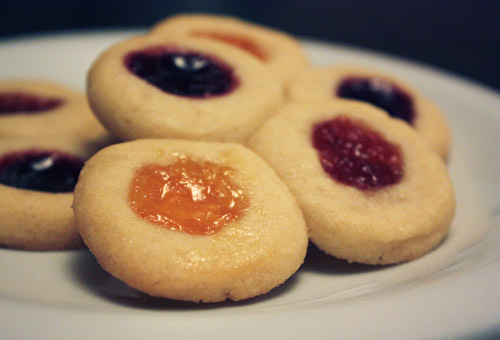 Simple thumb-print cookies are made a bit smaller than usual and grouped in threes to showcase apricot, strawberry, and black currant preserves. A melon baller was just the right size to scoop up dough for each round. Cookie number two is a chocolate pretzel from Martha Stewart's Cookies . I have to admit, working with this dough could have been easier. Rolling the ropes to be twisted into pretzels took a little longer than I would have imagined, but they're cute. 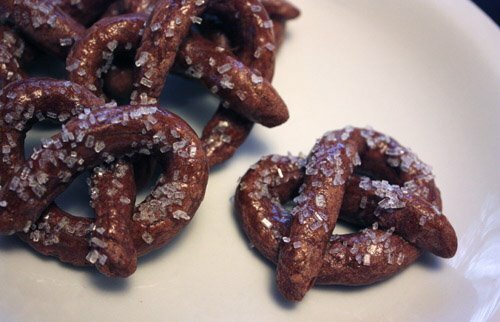 They were baked until crunchy with sparkling, sanding sugar to complete the pretzel look. Last, but certainly not least, is the caramel crumb cookie from The Modern Baker . 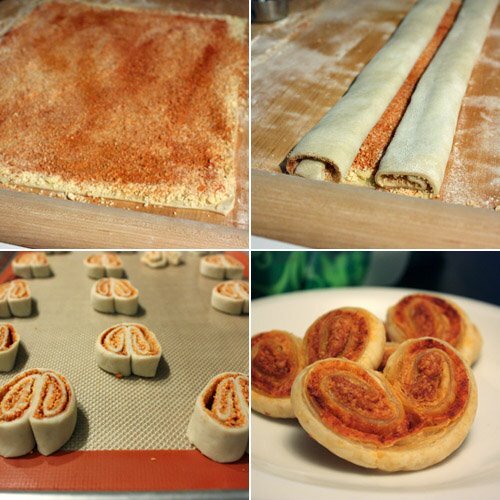 A simple pat in the pan dough is mixed and chilled while the caramel filling cooks. 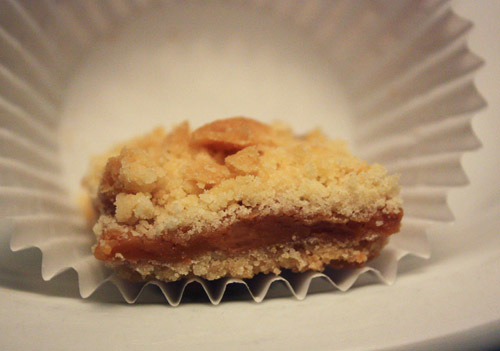 The caramel is layered on top of the dough, and the crumb topping is applied. Bake until golden and cut to the size of your choice. These cookie bars are simple and delicious. My kitchen’s cookie baking season has officially started. There remains the question of how much will actually fit in my freezer, but I’ll deal with that as I go. I like to bake a so-called regular cookie or two to go along with the more festive ones. This particular cookie appears to be just an oatmeal chocolate chip. Looks can be deceiving. It’s actually a pretty spectacular version of an oatmeal chocolate chip. 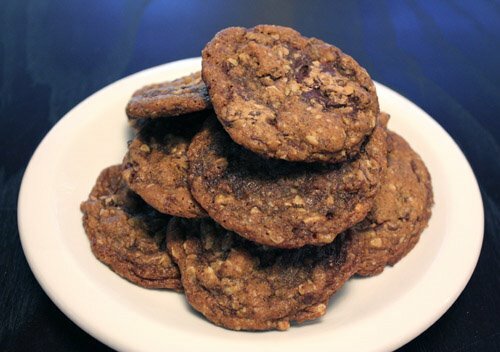 Back in September, I wrote about Demolition Desserts by Elizabeth Falkner and baked her smore brownies, and these cookies come from that book as well. The XS in the title is for extra sugar but it could also be for extra special. Falkner devotes a couple of pages to types of sugars, their unique properties, and how she uses them. For this cookie, dark muscovado sugar is used which is an unrefined, natural product of sugar cane. It contains more minerals and rich molasses flavor than a standard brown sugar. Commercial brown sugar is actually refined white sugar that has some molasses added back into it. The second sugar used here is Demerara which is made in the same way as muscovado, but the grain is coarser. It’s named for the colony of Demerara in Guyana but is now mostly produced in Mauritius. 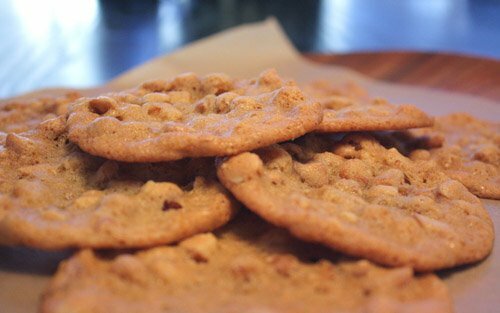 By using both types of sugar in this cookie, the dough develops great molasses flavor, and the Demerara provides a little crunch. To make the dough even more special, the oatmeal is pulsed a few times in a food processor and then is toasted in lightly browned butter. And, the chocolate? No regular chocolate chips here, although they are listed as an option in the recipe. Instead, I chose to make chunks from a piece of Callebaut bittersweet. 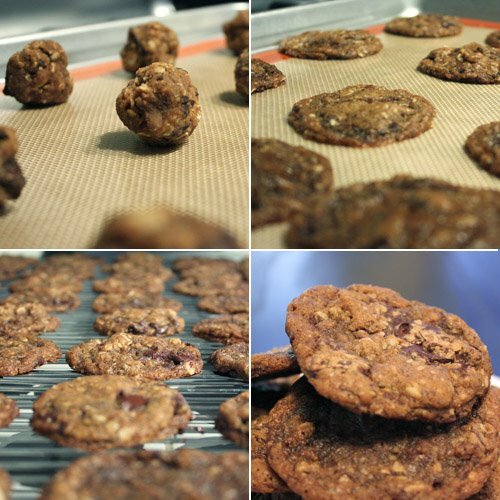 For a little cookie recipe, Falkner provides a lot of insight and suggestions. For instance, she precisely describes the steps involved in chopping and toasting the oatmeal. I appreciate this kind of enthusiasm and attention to detail and take it as a sign that she really cares about the quality of the outcome. For baking times, she notes differences in the texture of the cookies for nine minutes, 10 minutes, 11 minutes, etc. 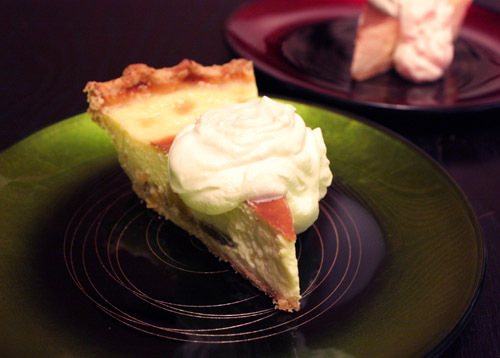 Her preferred baking time is 10 minutes for these, but she encourages the home cook to find his or her own favorite. I decided mine was 11 minutes which resulted in a flatter cookie with crisp edges. Shorter baking times resulted in a puffier cookie. 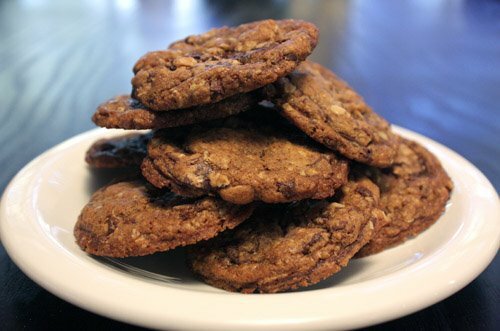 These unrefined sugars are delicious, and the texture and flavor combination of this cookie is definitely extra special. If I want something more regular on my cookie platter, I’ll have to bake something else. Back in October, Bon Appetit presented several hearty and comforting fall meals, and this was one of them. As I re-read the recipe, I realized I was a little short on time to follow the precise instructions. With just a couple of changes, I ended up with a very similar dish and a rich and filling dinner. My cauliflower came from Hands of the Earth farm, and I grabbed the pipe rigate whole wheat pasta at Central Market instead of penne. Other than using whole wheat pasta, my recipe modifications in no way improved the nutritional profile of this dish. The cream, butter, and cheeses were all used in their specified quantities. So, to speed up the process, I did not boil the cauliflower nor did I peel the tomatoes. Instead, I sautéed the cauliflower chunks over medium heat for seven minutes or so and then added the diced tomatoes with skins and green onions. The vegetables were transferred to a large mixing bowl. I moved on to the sauce while the pasta boiled. I prepared the sauce as suggested and added it to the mixing bowl with the partially cooked pasta. All was mixed and layered into the baking dish with more cheese. 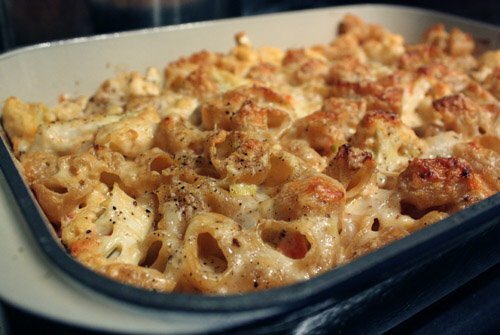 I skipped the breadcrumbs all together because I never apply breadcrumbs to mac and cheese, maybe some day, and it saved another few minutes. Instead, the remaining cheeses were the lone topping. The dish went into a 375 degree oven, rather than 350, and baked for 25 minutes rather than 35. To brown the top a little more, I turned on the broiler for a couple of minutes. It didn’t exactly become a five minute meal, but I saved 25 minutes or so overall. These days, I’ll take an extra 25 minutes when I can get it. As promised by the article, it was hearty and comforting. 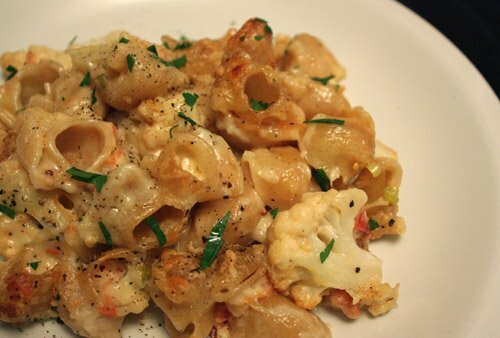 The flavor of the cheeses was fantastic, and the cauliflower was perfectly tender. I’m glad I skipped the boiling, or the cauliflower might have been too soft. Kurt would like to try the dish again with the dijon omitted, and I can understand his point. The mustard added a slightly sharp note to an otherwise very mild combination of tastes. The green onions, I think, could handle the job of delivering a contrasting flavor on their own while the mild cauliflower, pasta, and cheese stick to the business of comfort food goodness. It is rich, it is heavy, but there is cauliflower, and it is very enjoyable to eat. A few weeks ago, I mentioned using the Moosewood Restaurant Cooks at Home book for inspiration, and that was my resource for this meal. 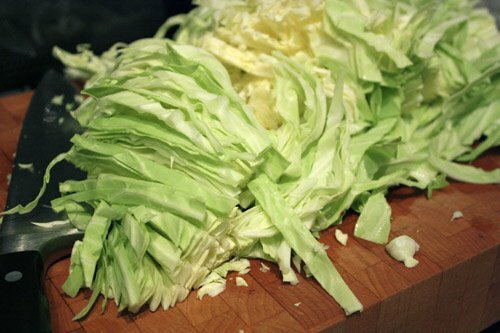 I was hoping to find an interesting way to use some cabbage and possibly some other vegetables I had on hand. When I arrived at the page for this Tunisian vegetable stew, I thought, ok, this sounds good and looks simple enough for a serviceable, weeknight meal. That proved to be true, but it was also really flavorful, vibrant, and satisfying. In fact, it was so good it really took me by surprise. 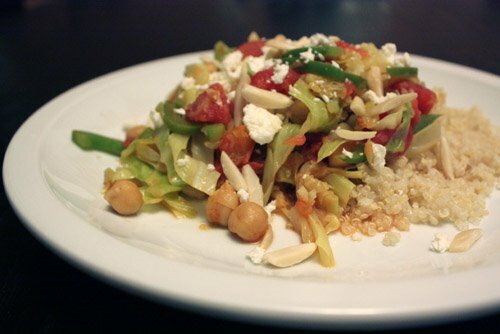 To start, onion is sautéed, thinly chopped cabbage is added with sliced green bell pepper, canned tomatoes join the mix along with chickpeas, then ground coriander, turmeric, cinnamon, and cayenne are added, and it’s covered and left to simmer for 10 minutes or so. I need to pause and ask if you’re aware of the health and wellness benefits of turmeric? Turmeric is known for its anti-inflammatory and anti-oxidant properties among a host of other healthful qualities. I’m always happy to add some turmeric to a dish, and I tend to add a little more than is requested. So, the spices added great flavor and the mixture gave off a lovely aroma as it simmered. At the end of the simmering time, fresh lemon juice was added. To serve, any grain would do, but I chose quinoa. The stew was ladled over a mound of fluffy quinoa and then topped with crumbled feta and some slivered almonds. Kurt and I were both expecting an eat your vegetables kind of meal, but we discovered it to be so much more. 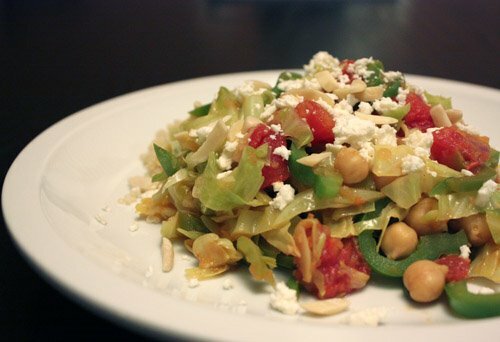 The diversity of textures, the bright lemon in combination with the spices, the fresh cabbage and bell pepper, the savory rounded flavor of chickpeas, the tanginess of the feta, and the crunchy almonds all made this a surprisingly delicious and enjoyable dinner. The Moosewood book continues to do well by me, and everything I’ve tried from it has or will become a repeated meal. I returned home after a great week in Ireland and got to pick up some fresh CSA vegetables the next morning. 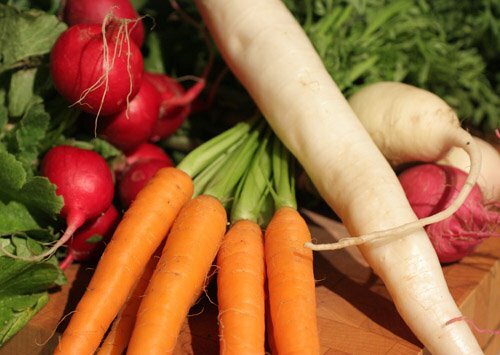 The carrots, radishes, and daikon were bright and beautiful. 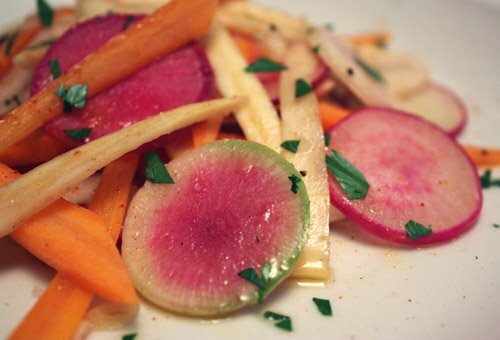 It’s the crispness of radishes and the sharp, peppery flavor that I like, and I usually always eat them raw. However, I have been intrigued by a few dishes I’ve seen lately involving cooking radishes. I pulled Patricia Wells’ Vegetable Harvest from the shelf and found a warm salad nicely suited to the season and these fine vegetables I’d just acquired. In the book, Wells tells the story of the first delivery of fresh vegetables she received in Paris, how colorful and fresh they were, and the recipe that was included. That recipe is close to what you see here, but I had to make a couple of changes. Jerusalem artichokes were to be included, but there were none at the grocery store and therefore none in my version of the dish. I also left out the turnips because I had both red and watermelon radishes. 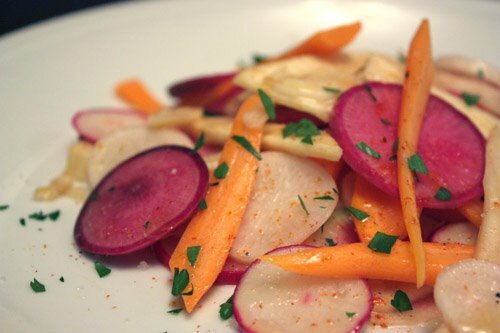 So, my vegetable melange included: carrots, red radishes, watermelon radishes, daikon, parsnips, and garlic. Now, the 16 cloves of garlic suggested in the recipe may sound like a lot, but they become mild and lovely as they cook. All the vegetables are to be very thinly sliced and then cooked over low heat with cumin, espelette, and a little olive oil. My pantry was missing piment d’espelette, I need to order some along with fennel pollen and more Aleppo pepper, so I used a small bit of cayenne instead. Everything cooked together, covered, for 20 minutes. Once on the plate, fragrant walnut oil was dribbled about, and I added some chopped parsley as well. The low heat ensures the vegetables retain some crunch but yield just slightly. I would suggest cooking the parsnips for a few minutes on their own and then adding everything else. Their texture was a little firmer than that of the other items, but it could have just been that the store bought parsnips weren’t as amazingly fresh as the CSA produce. The dish was nicely spiced by cumin and cayenne, and the walnut oil accented it very well. It’s an uncomplicated preparation, but each element played an important part, so don’t skip the walnut oil or cumin. The colors were thrilling and added to the sense of freshness. This warm but crisp salad with some rosemary roast chicken made a simple and delicious fall meal. 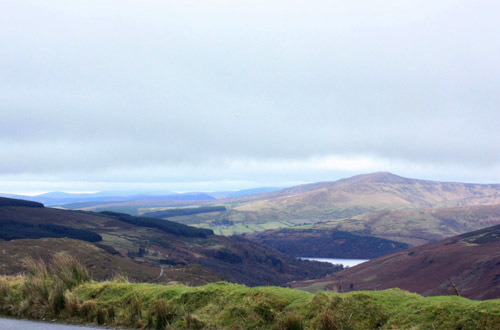 While spending Thanksgiving week in Ireland, we encountered many edible delights. One of those was a homemade, full, Irish breakfast expertly crafted by our friend Bill. 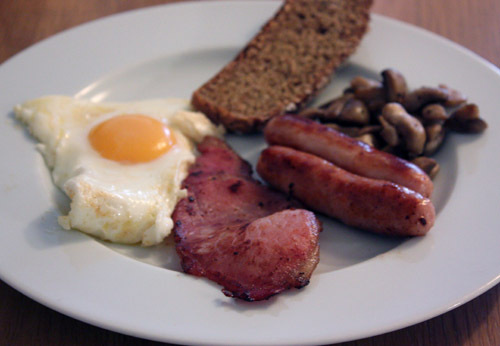 A proper Irish breakfast is generous in protein. 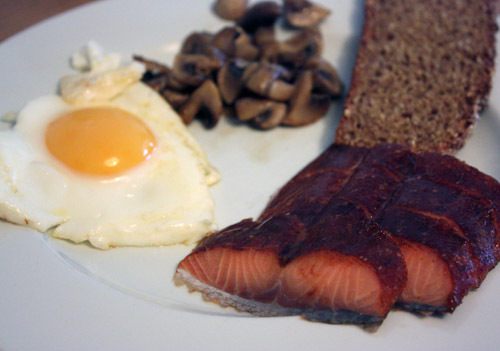 There are eggs, rashers or bacon, sausages, and white and/or black pudding along with sauteed mushrooms, possibly beans, tomatoes, brown bread with butter, and tea. Bill’s menu included chosen items from the traditional list, and because he’s aware of my indifference toward red meat, my plate received smoked salmon. The meal was perfectly prepared with fresh, delicious eggs, amazing salmon, and what I decided to call right, fine, Irish butter. Incidentally, I’ve become an Irish butter convert. Kurt was very pleased with the bacon and sausages as well. Thanks again to Bill and Sharon for a fantastic treat. We saw lots of sights and enjoyed many meals along the way each day. At Deep located in Howth, I chose a flaky, savory mushroom tart followed by the organic salmon entree which was incredibly fresh and cooked exactly right. We had a very nice evening with friends and a meal of Lebanese fare at The Cedar Tree in Dublin City Centre. I opted for the haloumi and falafel, but the multi-course chef’s choice meal looked fantastic. 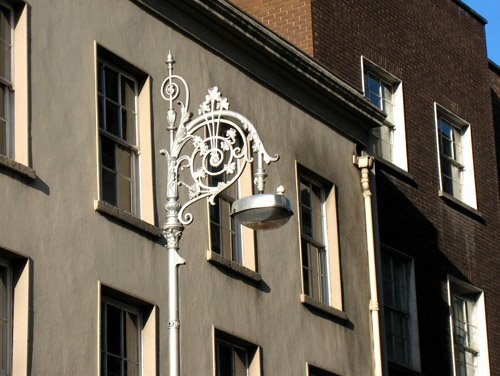 Brief stops at Bewley’s Oriental Cafe for tea and chocolate eclairs and at Butler’s Chocolates for cappuccino and truffles provided energy boosts for seeing more sights. At Fallon and Byrne, the oysters were unbelievably fresh and refreshing and another salmon meal was very good as well. Our last meal in Dublin, which was our Thanksgiving feast being that it was dinner on Thursday, was enjoyed at Carluccio’s. Olives, bruschetta, green salad, and pasta con funghi were fantastic. And, the strawberry gelato made for a lovely ending to the week. I’m still a little travel tired, not entirely ready to be done with vacation, and am moving slowly toward my own kitchen and food books awaiting me at home. It's possible that I added to my food book collection with some titles that caught my eye in Dublin. So, I have even more to read about and cook as soon as I get back into my regular schedule.